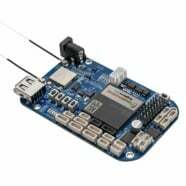 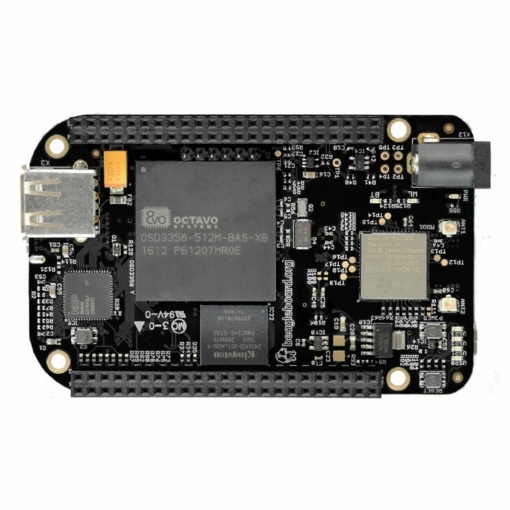 The BeagleBone Wireless also introduces the Octavo OSD3358 SiP (system-in-package) which integrates BeagleBone functionality into one easy-to-use BGA package. 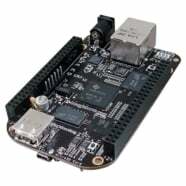 The board is open source and was designed by CadSoft Eagle. BeagleBone Black Wireless is based on the extremely successful open-source hardware design from the BeagleBone Black, a high-expansion, maker-focused, community-supported open hardware computer created by BeagleBoard.org Foundation. 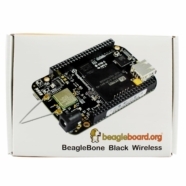 Focused on connectivity, the BeagleBone Black Wireless replaces the 10/100 Ethernet port from the BeagleBone Black with a high-performance 802.11 b/g/n 2.4GHz WiFi module with Bluetooth. Just like the BeagleBone Black, the wireless retains HDMI output, serial debug port, PC USB interface, USB 2.0 host, reset and power buttons, and adds two more status LEDs for WiFi and Bluetooth. Also retained is the 4GB of onboard eMMC memory with Debian Linux preinstalled, allowing the BeagleBone Wireless to boot in around 10 seconds and have you developing through your web browser in less than 5 minutes using just a single USB cable. Like the BeagleBone Black, the BeagleBone Black Wireless is compatible with capes for hardware expansion, integration and peripherals.